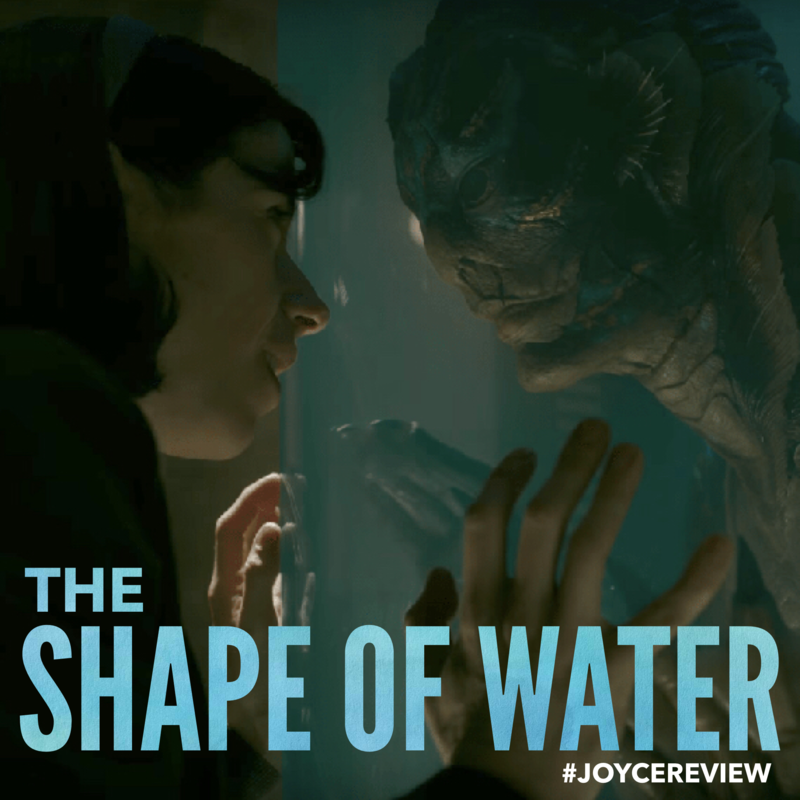 The Shape of Water (2017) My favorite drama of 2017 (because Jordan Peele’s Get Out! is Horror) is, hands down, Guillermo del Toro’s masterpiece, The Shape of Water. Reviews have been heavily on the positive side, but negative ones, in my opinion, have been based on trivialities. Dramas that hit on the fantasy level require that the audience suspend at least some disbelief. Just know that this film is beautiful in countless ways, ways that few can dismiss – not to mention it recently won 4, well-deserved Oscars. Though director Jean-Pierre Jeunet has some gripes about the film, I don’t feel that del Toro plagiarized Jeunet. Someone who knows film can easily say, “Isn’t this just a cross between Splash (1984) and Creature from the Black Lagoon (1954)?” It did remind me of Jennet’s Amélie (2001) in that it had French music and a specific color tone. Amélie liked simple thing like putting her hands in something soft and cracking crème brûlée. Elise liked hard-boiled eggs and masturbating in the tub. Though there may be similarities, I believe these were simply chosen to create an atmosphere, styling, and sense of connection to the audience that suited to enhanced the story. Do knowing these similarities detract from the movie? For some people it definitely does or will. In my opinion, not at all. One thing that really stood out was the remarkable acting of Sally Hawkins and Octavia Spencer – though Michael Shannon’s character of Strickland is the Molotov Cocktail behind the film. It hasn’t been since Joffrey and Ramsey of Game of Thrones has someone been so hateful. Yes there are a couple of things that stick in my craw, like would a janitor be able to have her lunch break inside a top-secret laboratory and could you really fill up a bathroom full of water? Definitely a no, but does it really detract from the beauty and entertainment of this movie…. again, no. Overall, this was a magnificent movie that you are bound to watch more than once. If I were you, I’d go out and get a copy for your movie library. Remember to follow my on instagram at @chencenter for the first-glimpse of my surprise review. A new movie review will appear on every 3rd picture! There is seldom a movie that grips the audience from the very first scene and sustains the brilliance throughout the entire picture. The Hustler is one of those films that, like the character Eddie when he hits his stride, can’t lose. Like most guys my age, we tend to shy away from films made before the 1980’s (with the exception of Star Wars), at least, that is, until we learn something about what makes a truly wonderful film, and we go on to realize just how amazing it is to have one that includes Paul Newman (Cool Hand Luke, Hud), George C. Scott (Dr. Strangelove, Patton), Jackie Gleason (of The Honeymooners) and Piper Laurie (Carrie). The wonderful acting, cinematography, and directing (by Robert Rossen) enables The Huster to “rack up” a perfect 10 on The Joyce Review. (Bert Gordon to Findley [about Eddie])I didn’t ask him, ‘Can he beat ya?’ I already know he can beat ya. I asked him, ‘Will he?’ To Eddie, that’s two different things. Winning is a habit. But then, so is losing. Losing, at face value, doesn’t have much of an appeal… however, nothing is expected of you (especially if you call upon excuses). People feel sorry for you and, in some circumstances, you are given help and attention. Think for a moment about mountain climbing. By winning, you succeed, coming to the mountain’s apex you all of a sudden have responsibilities and your choice of directions. Those whom are masterful winners will make their choice of staying atop, not by fighting to hold position, but by reveling in the joy of climbing, looking back over their trodden path, and the vast landscape yet to discover. 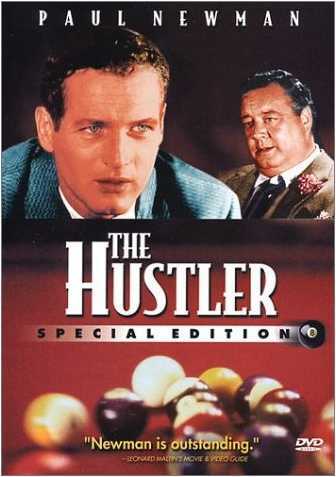 The Hustler is a film that succeeds in every facet of filmmaking and stands out in my mind as the epitome of film perfection. Winning only 2 Oscars (Best Art Direction-Set Decoration and Cinematography, Black & White) out of 9 nominations (missing out on Best Actor-Newman, Best Supporting-Gleason, Best Supporting-George C. Scott*, Best Lead Actress-Laurie, Best Director-Rossen, Best Picture-Rossen, Best Writing/Screenplay-Carroll,Rossen), The Hustler is proof that either its message is felt (that even the best, loses) or that the Academy is crooked. Either way, The Hustler remains aloft, coasting far above external validation and finding its nest in the movie collections of those that have an eye for the exquisite. *The word “losing” has, in our society, a great negativity about it. Athletes (for the most part) despise losing and see winning and losing as the grande score sheet that reflects who they are and what their abilities are. Losing, in a more philosophical and psychological context brings about growth, maturity, betterment, and is (usually) lacking from someone who consistently wins. “The art of losing” is not meant to imply that losing is one’s goal, but rather, an artistic source for finding one’s true metal. *George C. Scott, the consummate professional, held great contempt for the Academy Awards and shocked Hollywood as the first person to ever refuse an Oscar® (Patton, 1970). He called it a ‘2 hour meat parade’ and later said that the whole thing was offensive, barbarous and innately corrupt. Was it the organization itself, the playing on the “stars” vanity, or the idea of awards in general? I suppose we’ll never know. But to The Hustler’s credit, it should have won more – showing us that (at least in 1961) the Academy had a smidge of favoritism for West Side Story (winning 10 Oscars®).